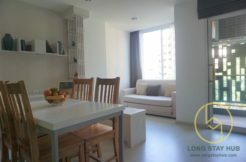 Let us introduce you to this urban house for rent on Chang Phueak sub district. This house is located just 200 meters from the super highway road. The entire home is newly remodeled. This home has been outfitted with tasteful and modern furniture and material. All three bedrooms has equipped with extensive closet space. First floor is tiled floor and the second floor is laminate except in baths. It is combined 3 bedrooms on the 2nd floor; a master bedroom with king-sized bed coming with en-suite bathroom with a walk-in shower and 2 extra bedrooms in queen and twin beds, a spacious living room with LG LED TV and sofa set, a kitchen well equipped with range hood, hob, refrigerator and toaster and a home office with a large table. This house has plenty storage such as cupboards in kitchen and storage room underneath the stair. This house is a perfect choice for those who are looking for a spacious house near to the town. This house is located near the Kuangsingha intersaction which is the heart of Chiang Mai community area and super easily access to all the major attraction in Chiang Mai, such as Nimmanhaemin Road, Lanna Hospital, Central festival Chiang Mai and the old town.